More than 100-miles west of Bakersfield, along the central coast of California.—a piece of Kern County is planted among the rolling vineyards of Paso Robles—rows and rows of vibrant vines, where the best fruit is turned into award winning wines—the place where Kern County’s deep roots in agriculture comes alive in the vineyard. We visited one of those vineyards, just east of Paso Robles, the place where winemakers and vineyard owners express their true craft—and there’s one local family whose responsible for millions of these vines, all beginning in Bakersfield. 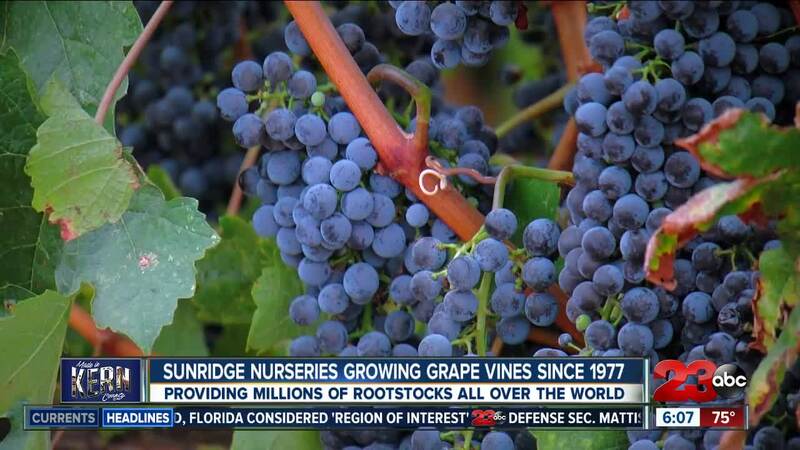 At Sunridge nurseries, just off highway 58 near Edison, is where the Stoller family has been getting their hands dirty, helping table grape growers and vineyard owners plant their future. “Dad’s the mastermind and the brainchild,” Craig Stoller CEO of Sunridge Nurseries. His father Glenn—who had years of experience in the nursery industry—founded Sunridge Nurseries in 1977, as a way to provide the highest quality grape vine rootstocks, at a time when the wine industry was seeing a boom in Napa valley and Sonoma. “My first job, he handed me a customer list and a stack of wine country maps and he said, “go meet the people and go learn the wine country,” Stoller recalled of his first job in the company. Stoller quickly learned the need, and Kern County could rise to occasion—today, Sunridge Nurseries providing millions of these rootstocks to the wine industry, and table grape growers all over the world—growing hundreds of different clones, propagating vines in their more than 300,000 square foot facility. ”This is what’s called a bench graft, and it starts out with dormant grape cuttings,” Stoller shows us. From their expansive facility east of Bakersfield, the vines produced here planted in thousands of vineyards—making up some of the most prestigious vineyards in the world. With world renowned success in the rootstock business, he and his wife Nancy wanted to experience the other side of their industry—In 2001, planting their own vineyards, with cuttings from Sunridge, in the El Pomar district of Paso Robles—a region known for steep hills, chalky clay soil, perfect for Bordeaux and Rhone varietals. In 2007, the Stoller’s opened their first winery, Sextant—now with two tastings rooms—becoming known for award winning cabernet’s, chardonnay and Rhone blends—The Stoller family planting deep roots in the wine industry, their work coming full circle. A journey and mission to cultivate the best vines, and produce legendary wine, that began right here in Kern County.